bypass area of restricting model. Quite often (in machining with zero stock for instance) the edges between neighboring surfaces are formed when machining the surfaces themselves, and do not require additional machining. In this case, it is enough to include only the machining areas of the form-creating surfaces. Due to exclusion of unnecessary areas, the length of the resulting toolpath decreases and consequently, decreases the machining time on a milling unit. Defining the roll type as surfaces only activates this tool movement toolpath creation method. In the <With edges> mode, the resulting toolpath consists of the machining areas of the form-creating surfaces and the areas of edges rolling. This mode could be used for instance, to make edges round when machining a model with a positive stock. 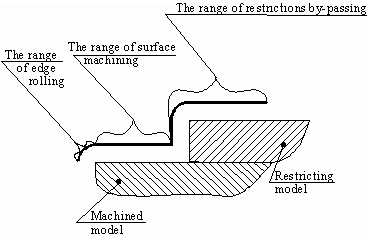 When using the <With restricting model> mode, all machining and rolling areas of the model and the restricting model will be included in the resulting toolpath. Besides this, in the plane and drive operations all the vertical toolpath areas will be added. The roll type can be defined in the <Strategy> page.